Donald Judd: Specific Furniture at the San Francisco Museum of Modern Art (SFMoMA, until 4 November) brings to mind Ad Reinhardt's quip that sculpture is what you bump into when stepping back from viewing wall-bound art. A couple of Judd's flanged metal chairs, were they not pedestaled here, might deliver sharp reminders of Judd's demand for design "rigour" to careless viewers of the drawings included in the show. Judd believed that any chair masquerading as sculpture, like any sculpture purporting to serve as furniture, was doomed to aesthetic failure. But the meaning of Minimalism, the term critics still drape upon Judd's work, includes "hard to differentiate from non-art realities". Judd (1928-94) rejected the term Minimalism for his three-dimensional art because it suggested that a narrow process guided decisions in his search for optimum materiality and form. (The complexity of his late multicoloured works make this rejection explicit.) Yet many of the chairs he designed (and some that he collected) might qualify as sculpture in the eyes of someone only casually familiar with his art. The main difference between his sculpture and furniture concerns "proportion"; as Judd defined it: furniture must have "visible reasonableness", including functionality—a test he thought no worthy sculpture needed to pass in the same terms. Despite the fact that Judd had invited me there, along with some other guests who had already left, and despite the analgesic effect of the single malt we sipped while in laconic conversation, I could not help noticing that the discomfort of his furniture and of his company had much in common. As the uncushioned chair taxed my bones and its arms wore grooves into mine, I began to feel a prisoner of his sensibility, as even his most severe sculpture and architecture had—and still has—never made me feel. 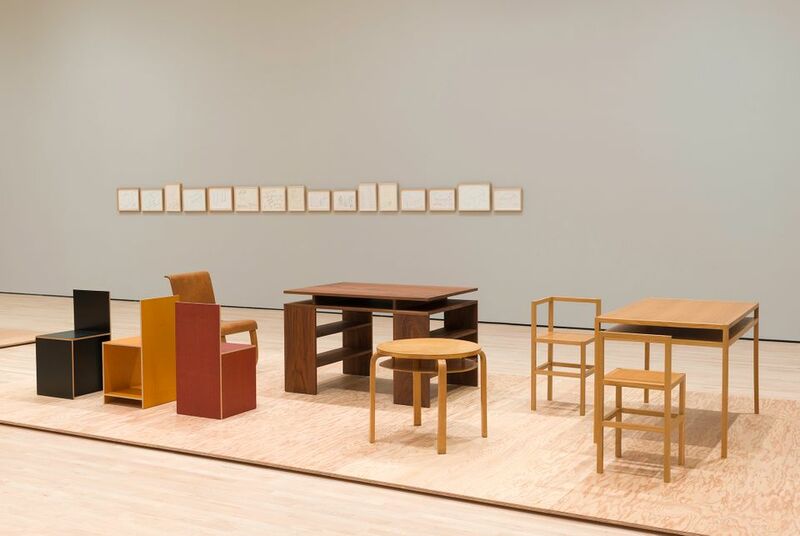 This experience came back to me as I sat in the oak Frame Chair that SFMoMA has installed for visitors' use, along with several other examples of Judd furniture, just outside the exhibition's single large room. The chair makes you sit at attention, somatically enforcing Judd's temperamental preference—not that one pay attention to him, but to have one's attention turned on, primed to listen, to notice, to contribute, as appropriate. His conversation, not without humour, frequently rewarded the heightened alertness it demanded, but like the seating, it could be wearying. A fellow visitor at SFMoMA squirmed in another boxy Judd chair nearby because only her toes could reach the floor. That Judd's furniture is a better fit for me, I remembered, depends on his proportions having been similar to mine, though he was bulkier. The exhibition gives visitors close views of Judd furniture, grouped on plywood islands, along with pieces by Gerrit Rietveld, Rudolph Schindler and Alvar Aalto that he collected and used. Flanking walls display a selection of Judd's related drawings. As insistent as Judd was upon his furniture's distinctness from his sculpture, he handled both, as photographs in the exhibition guide affirm, with keen attention to their claims on surrounding space and settings. Comfortable furniture tends to withdraw from our awareness as we use it. For all the open structure that Judd's can have—airy shelves incorporated into chairs and tables—it refuses to sink into use. Here, that resistant quality comes clear, though many may question their experience of it.